In the modern era in which we live, interpretation of laws is in flux. The virtual world creates new areas of query for lawmakers, courts, businesses, and their advisors. The interpretation of the Commerce Clause of the U.S. Constitution has been up for debate in recent years due to the increasing demand for goods in the online market place. Consumers are purchasing at an increasing rate through remote sellers who, due to their lack of physical presence in the purchaser’s state, have not collected and remitted sales tax to those states. The impact: wide‐swept state sales tax losses. Historically, according to Commerce Clause interpretations, a “physical presence” standard had been imposed regarding the charge of sales tax on purchases. Under this standard, a seller had to have property, people, or some other physical connection with the state to require the collection and remittance of sales tax. For the buyer or everyday consumer, states could impose use taxes requiring a tax payment on items for which no sales tax had been paid. With low compliance from consumers paying use taxes and increasing online purchases, states called out for change. 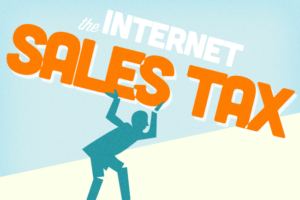 Many states, including Oklahoma, have responded to the internet purchasing environment by enacting economic nexus laws, which determines taxability based on number and/or dollar amount of sales. Nexus is a term used to determine the threshold of taxability for businesses selling goods or services in a state. These policies were attempts to expand the physical presence requirements to obtain taxability on larger internet sellers. On June 21, 2018, in the case of South Dakota v. Wayfair, the U.S. Supreme Court overturned the previous precedent of the “physical presence” standard in hopes to yield a more fair approach for states calculation of sales tax. Now, nexus has been expanded to include economic or virtual presence as well as physical presence. With the change of interpretation by the U.S. Supreme Court, states will have greater leverage to demand taxability on internet sales, all in hopes to stem state tax revenue losses. Beginning July 1, 2018, Oklahoma imposed new sales and use tax notice and reporting requirements for remote sellers in order to increase compliance on sales and use tax payments. transaction should be analyzed and tested to determine if it is taxable or nontaxable. Sellers should confirm states’ potential new registration requirements for e‐commerce sales activity and be prepared for continued challenges and movement by the states to go after taxability from functions of e‐commerce. While states primarily focus on collecting and remitting sales tax from sellers, reported information requirements will give states access to transaction data to more readily enforce and pursue collections of use tax from consumers. Consumers should expect to pay increasing sales or use tax on purchases regardless of whether the purchase location is the traditional brick‐and‐mortar store or the online virtual web. Consumers should be on the look‐out for increasing information from remote sellers about use tax liability and other transaction reporting requirements. States will continue to fight to recoup declining revenues. We expect state revenue departments to issue guidance regarding the South Dakota v. Wayfair decision in the coming weeks and months, and we will be following those developments closely. In the meantime, if you would like to discuss how the decision may impact your business, please do not hesitate to contact us.